A sincere thanks to Corinne for suggesting our seasonally appropriate Baby Name of the Day: Harvest. 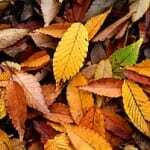 In Old English, this was simply the name of the season we now call Autumn or Fall. Which makes sense, because it’s the season in which the harvest traditionally takes place. It wasn’t until around the fourteenth century that the word referred specifically to the act of gathering crops, as well as the crops themselves. Festivals are traditionally associated with the autumnal equinox – also known as the Harvest Moon. By the late sixteenth century, a Harvest Home festival was celebrated in England, and it informed the Pilgrims’ first celebration of Thanksgiving in 1621 at Plymouth Rock. Similar festivals are found elsewhere, including Russian and Poland, and beyond Europe, too. In China and Vietnam, there’s a Mid-Autumn Festival. Modern pagans celebrate the festival of Mabon at the autumnal equinox, and it is also a harvest festival. Thanksgiving as we know it is something of a modern invention. It was formalized by President Abraham Lincoln during the Civil War. But proclamation of national days of thanksgiving has a longer history, including one proclaimed by George Washington, and others, predating the United States. They weren’t necessarily tied to the growing season or the fall at all. 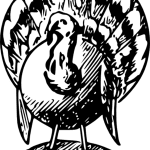 But over the years, we’ve bundled them all together, equating turkey, pumpkin pie, and those cranberries in a can, with the bounty of agriculture and the act of giving thanks. Neil Young released a studio album called Harvest Moon in late October 1992, a follow-up of sorts to his 1972 album called Harvest. The word can take on a sinister cast, as in 2013 horror-thriller film Harvest, when the crop is human organs. A 1993 film had the same title and a similar premise. It’s been the name of multiple novels over the years. Harvest: But is it a Name? 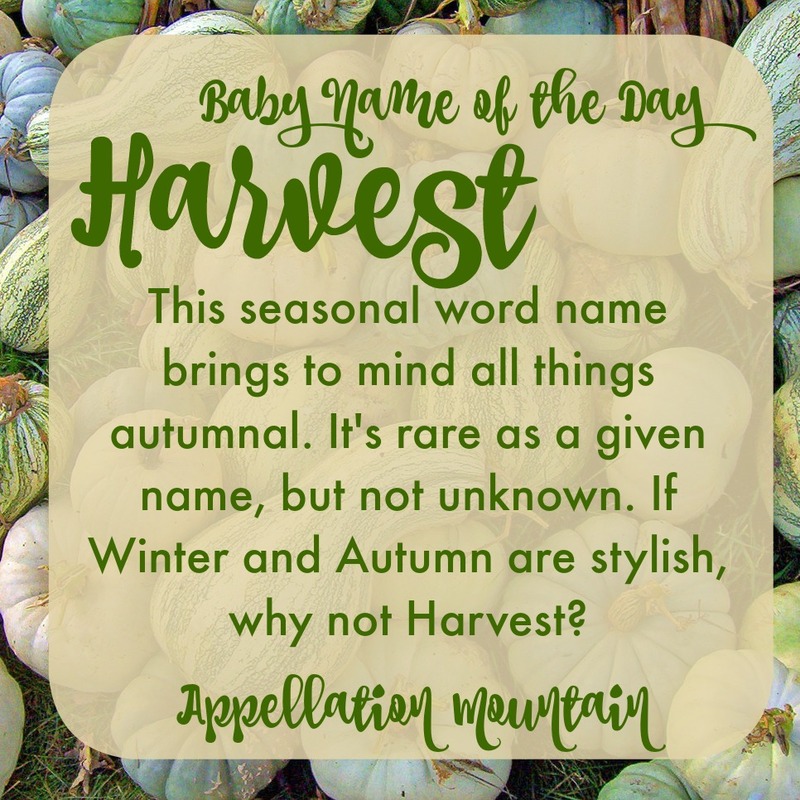 So harvest is a noun and a verb, and a poetic way to refer to all things autumnal, but is anyone actually named Harvest? Nine girls and five boys were given the name in 2014. Since 1914, it has seen sparing use for both. 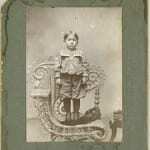 It was slightly more common for boys in the earlier part of the twentieth century, and has been favored for girls from the 1970s through today. But the numbers are more or less equal over time. 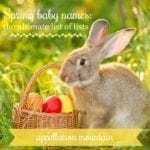 Autumn, Summer, and Winter are all widely accepted names for girls – perhaps the reason why the name leans feminine in recent decades. We love a great H surname name, from boys’ favorites like Hudson and Hunter, to stylish choices for girls, like Harper and Hadley. Modern virtue names are having a moment, with choices like Valor and Haven feeling quite current. And, of course, there’s that letter v. Along with the long a sound of Ava and Mason, it’s one of the mainstays of baby names in this moment. If you’re looking for a daring middle name for an autumn baby – boy or girl – this is definitely one to consider. 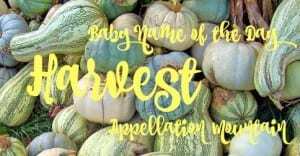 And if bold noun names are your style, Harvest could even be an intriguing possibility as a given name. What do you think of Harvest as a given name? Too word-like to wear? Or an interesting possibility? If so, better for a boy or a girl? My name is Harvest Joy Yvonne I am 35 years old. I get mostly compliments on my name and a few odd or confused looks about it and of course a ton of people ask me how I got this name. My parents are very Christian my father was a minister most of my life. My parents pulled my 3 brothers and my name all from the bible. Though my name isn’t actually a person in the bible, the story is that while they were searching for a female name that they liked as well as one that was on the eclectic side seeing as before they were in ministry they were both hippies reformed to Christian’s and they still enjoyed fun and nature loving things In life they were having trouble finding a female name that they felt really good about. Also one that was different enough for their liking. So while they were searching through the bible, they ended up stopping on multiple different pages to find inspiration and each page they stopped on all had mentioned something about the Harvest. So after taking almost 3 days before giving me, their newborn daughter a name they both decided that they both liked the word Harvest as a name and felt it was meant to be for me. I like it personally. Mostly because I dont know any others with my name. I like it’s original feeling. My name is Harvest. I am a 37 year old woman. Im still waiting to meet one but its been strange growing up with the name. Its always mispronounced or basically forgotten because its different. My granddaughter, Harvest Lee, was due on Thanksgiving, born on a full moon in October. With straw colored hair and bright green eyes, there could not be a better name for this true nature child. My middle name is Harvest and I love it. If you like this name but are worried about your son’s future with this name, don’t be. I get a lot of positive comments often on it and I think it helps to identify me as someone who is refreshing and resourceful, similar to the word harvest itself. I named my daughter Harvest Liana in 2013 she was born in September and I am an avid gardener. Before I named her I searched everywhere for her name and never found it to be a first name. I love her name and the response most people have when I tell them her name. She gets so excited to see her name everywhere in the fall also. Many older folks didn’t like her name but it fits her well we don’t shorten it all. The best part is that unlike most of her siblings she never has another in her classes. Only 1 Harvest so far. My name is Harvest Lenee. I’m 41 and have never met another named Harvest much less a girl. It’s different. In records from the 18th century, I found 4 Harvests – 2 male, 2 female! It still seems pretty evenly unisex to me. It seems masculine to me. I like it. With the nickname of Harvey, this feels retro, fresh, and masculine all at once. It also has the same ‘vest’ as Sylvester. That puts it even more in the blue camp for me!